Parents, some decisions about your child’s body should not be made until they are old enough to give “legitimate” input. Legitimate implies that they realize all of the medical, emotional, and societal implications. Piercing your daughters ears at the ripe old of 3 months, I’m OK with that, reason being they forget that the earrings are there and never mess with them (less chance for infection). But, piercing your son’s ears at the same age for the same reason – Scandalous!!! Piercing anything but the ears-Security!!!!!!! 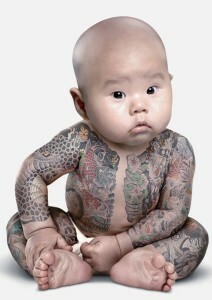 Tattooing a child, male or female, at any age – Somebody call child protective services!!! Fake nails on a child before High School – You must have money to burn!!!! Oh dear Lord….this is wrong on so many levels. First of all tattoos are painful and while perhaps less so on newer skin still quit painful, some area’s more than others. Perhaps when this child grows he/she will decide that this is most unappealing and cannot do anything about it. The list goes on and on. A child is not a canvas on which we cut and mar. I’m heartbroken over such selfish behavior and misguided thoughts of the parents. I have no problem with tattoos in any way shape or form but this right here…disturbingly wrong. Piercing a little girls ears…that’s fine because I believe they will want pierced ears at some point anyway and it’s easier when they are babies than when they are say 8. Trust me on that one. What will it be next? Tattoos? Personally, I don’t think parents have any right to disfigure a baby girl or boy. My daughter is seventeen and has never wanted her ears pierced. My nineteen year old son pierced his own ear. You never know what they will want so you shouldn’t force the choice on them. Parenting Beyond Punishment I believe in body autonomy, which means children should have the chance to choose what happens to their body. A child this young is too young to choose tattoos or piercings. I’m okay with Henna tattoos, unless the child complains…body autonomy is an important part of protecting children from predators and toward empowering them to make good decisions as they reach adolescents.